Waterbirds and migrant waders on the coast around Surabaya. The coast around Surabaya is great for waders and waterbirds, with some colossal numbers of birds during the northern winter months. Here we give details of a couple of sites that would be worth a day trip for anyone who found themselves in the Surabaya area with time to kill. On the south-eastern edge of Surabaya the coast becomes dominated by fish ponds and small areas of mangrove. One such area is on the seaward side of the village of Wonorejo Rungkut (there are lots of places called Wonorejo in east Java, so make sure to get the Rungkut bit in too). From the village you can walk or take an Ojek towards the coast and very soon you will find yourself among fish ponds, scrub and small areas of mangrove. 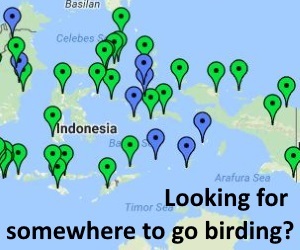 Lots of birds have been recorded in this area over the years, and on a visit you might expect to see good numbers of waders, including breeding Javan Plover, plus Sunda Coucal (try along scrub-lined water channels) and Javan White-eye (patches of mangrove). If you are lucky you might also see Java Sparrow and Red Avadavat. Take a scope and sun tan lotion to get the most out of the site! This is the name of a promontory about 30km north of Surabaya, with the village of Pangkah Kulon in its centre. The immediate vicinity of the village is dominated by rice paddy, but beyond that lies fish ponds, and beyond that lies large areas of tidal mudflats. 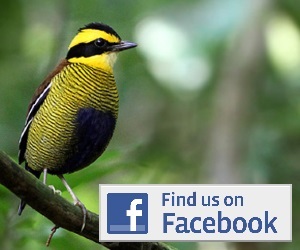 The rice paddy and fish ponds you can explore on foot and the birding is similar to Wonorejo Rungkut above. For a real treat, however, charter a small fishing boat for a morning or evening (whenever the tide is out) from the riverside east of the village and head out to the sea. To find a boat just ask around where you will see them all moored and someone will soon direct you. Expect to pay Rp 3-400,000 for half a day. The boat drivers will guess what you want to see and so know where to take you. In the event they don’t, just say you want to go to the sea, and then just keep pointing at interesting looking areas when you are there. The number of birds out on the mudflats can be impressive, and carefully looking through them should get you Asian Dowitcher in addition to more common waders. The mudflats also seem to regularly support a flock of wintering Australian Pelicans. As you travel to and from the sea look out along the riverside for Sunda Coucal and Javan White-eye (where there is mangrove). To get to Wonorejo Rungkut simply get a taxi or Ojek from anywhere in Surabaya city (a hotel, the airport etc). There is no accommodation locally, but there are a million and one options in Surabaya proper. To get to Ujung Pangkah/Pangkah Kulon you can travel by taxi from Surabaya (about 2 hours) or get a bus from Surabaya to Sedayu and an ojek onwards to Pangkah Kulon. There is no formal accommodation in Pangkah Kulon but you might be able to find a floor to sleep on by reporting to the village head (Kepala Desa) if you wanted to stay longer than a day trip.